With all sorts of subscription services popping up all over the place--from beauty products to baby things to wine and food galore, these monthly subscription boxes are sweeping dedicated consumers off their feet; there is seriously a box for everything and if there isn't, just give it a little time. 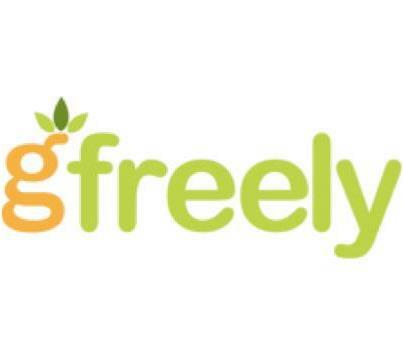 gfreely.com is an exclusive gluten free subscription services specializing in bringing its customers the best of the gluten free world! "Today, gfreely makes a healthy, sustainable gluten-free lifestyle simple, accessible and fun for consumers all over the world. From our monthly subscription boxes and online shop to our popular recipes and tips, we’re always on the hunt to find the best in gluten free and share it with you! By helping you discover and purchase delicious gluten free products, the gluten free diet can be one that you will enjoy." Like any other review I receive, this box of gluten free goodies was eagerly anticipated! It did take a little while to arrive, but I'm sure gfreely has a lot of these review requests since they are a pretty fabulous company. My box included Crystal Noodle's Mushroom Soup, Dang Toasted Coconut Chips, That's It Cherry and Apple Fruit Bar, Chunks of Energy Squares, Sen Cha Original Green Tea Leaf Mints, Nunes Farms Sweet Chipotle Almonds, and Kay's Naturals Mac & Cheese Protein Puffs. With anything else, each product was fun to try out and I definitely enjoyed the whole process. There were some obvious winners (almonds and mints) and some not-so-great contenders (mac & cheese puffs). Regardless of my personal opinions on what the box included, it was interesting trying out everything with the different mixes of textures and flavors! I really like that last line of their description: 'By helping you discover and purchase delicious gluten free products, the gluten free diet can be one that you will enjoy.' Going gluten free can be a very difficult transition, especially in the beginning stages. You think you're going to lose out on all the delicious yet horrible for you foods you crave, but you just have to twist your line of thinking. With a little more effort and research, you're diet can be as delicious as everything else available; the only difference is it will be healthier and make you feel better, both mentally and physically! gfreely boxes are available in 1 month, 3 month, or 6 month subscriptions. If you're interested in purchasing a subscription for yourself or for someone as a gift, head HERE for more details. Disclaimer: I was provided a gfreely box and all the above products in it courtesy of gfreely.com in order to facilitate this honest review. All opinions expressed above are 100% mine and mine alone unless otherwise stated. Please do your own research before committing to purchase a product or service as your opinions may vary. Labels: Crystal Noodle, Dang, gfreely, gfreely.com, gluten free, healthy, Kay's Naturals, review, Sen Cha Originals, subscription, subscription box, subscription service, That's It. that is so great for all the gluten free diets/ needs out there. Not sure if I would like mac & cheese puffs but can almost bet my kids would have no problem gobbling them up! 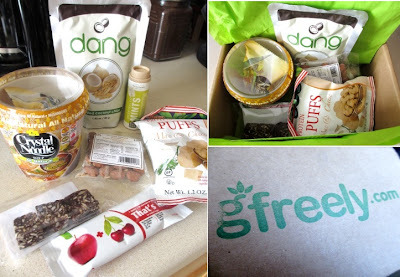 We are not gluten free here, but I love that there is a subscription box for those who are. It makes trying new products easy! Thanks for sharing. Looks like a great selection of goodies! It seems more and more people are going gluten-free, so there will be better options popping up every day. Good to have a chance to try different things out without a major commitment! Thanks for sharing about this site! I have never heard about it. It looks they have a great selection to choose from. I have a close friend who cannot eat gluten. Despite the variety of foods out there that are gluten-free, it appears in so many foods that it is nice to have more choices. She will love this option! Thanks for the info. I love the idea of this box... thank you for the review.. Wonderful idea, I will have to check it out! I know a lot of people who eat gluten-free and can just imagine the amount of people who will be flocking to this subscription program. The items you received sound really unique. Thanks for the review and we are so glad you enjoyed it!